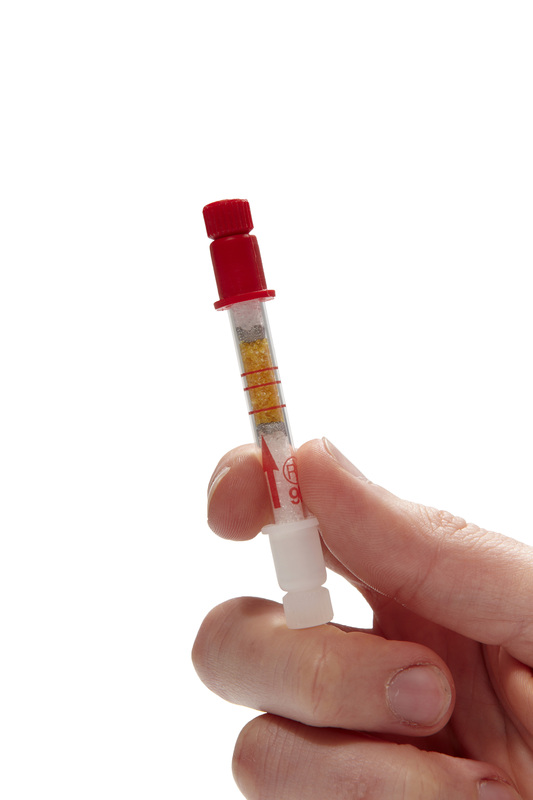 The only single use breathalyser in the world to accurately alert the user at three different alcohol levels covering all limits in place in the UK and Ireland, including the lower Scottish limit. Quick and easy to use. As of 1st July 2012 it is illegal to drive in France without an NF Approved breathalyser in your car. To comply with the law you must have an NF approved device, not just any breathalyser will do. AlcoSense Single Use NF Breathalyzers are one of only a couple of products worldwide to meet and exceed the NF standard, and bear the NF mark of approval. If you require the NF product, please click here. Many products claim this, but we can say this with 100% confidence. Why? 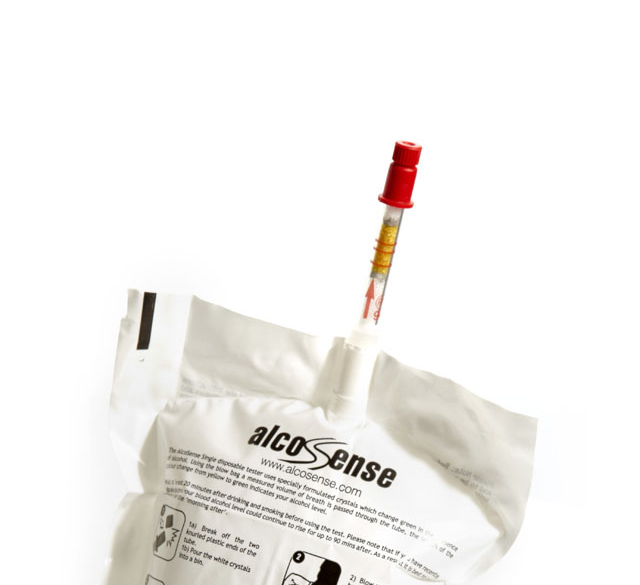 Because derivatives of the AlcoSense Single Use Breathalysers are used by Police Forces in over 30 countries including the Police Nationale and Gendarmerie Nationale (Police) in France. They’re used as a quick and effective screening device to show the Police Officer if the driver is over the limit, if the suspect fails the text they will be taken to the Police station for evidential blood or urine testing before conviction. 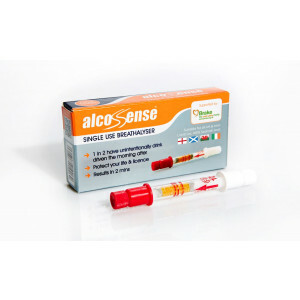 AlcoSense Single Use Breathalysers are the only single use breathalyser to not just tell you that you have alcohol in your system, but to also accurately indicate how much. Three rings around the tube represent the three common limits in the UK and Europe; 0.2‰BAC for the Irish Professional Driver Limit and Eastern Europe, 0.5‰BAC for the Scottish, Irish and Continental European Limit and 0.8‰BAC for the English and Welsh Limits. 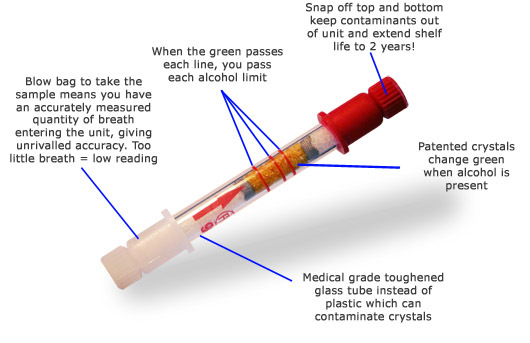 Patented crystals inside the tube change colour from yellow to green in the presence of alcohol. 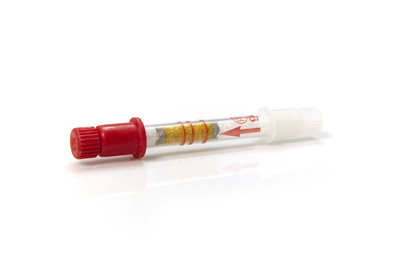 The further up the graduated tube the green colour appears the greater the concentration of alcohol the user has in their system. As the green colour change touches each line, you’ve passed each limit. Simple! In the example above the green has passed the first line but not reached the second, you would be under the 0.5‰BAC limit but over 0.2‰BAC. Please note: If you chose the AlcoSense Single NF version for driving in France, the unit will only have one line indicating 0.5‰BAC to comply with the NF standard. 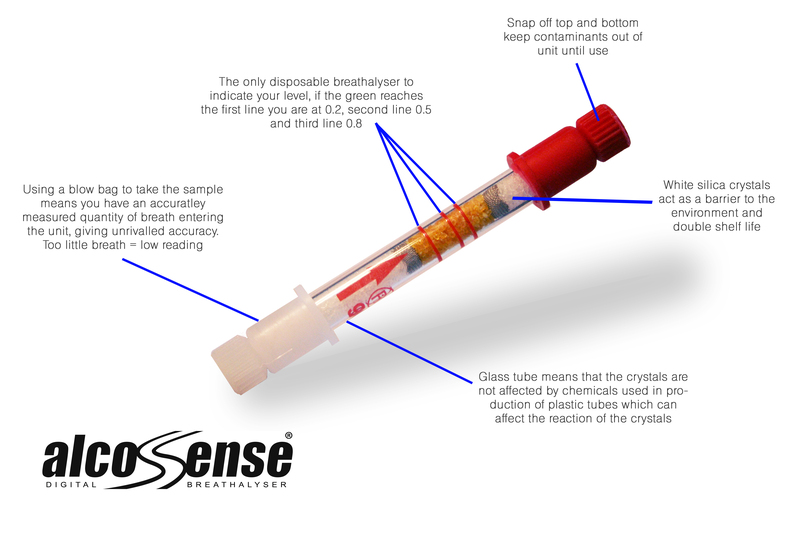 AlcoSense Single Use Breathalysers use a blow bag to make sure the right volume of deep-lung air passes through the tester. Too little air equals a falsely low reading, too much equals a falsely high reading. Having the blow bag eliminates this issue and helps to give you one of the most accurate disposable breathalyser readings in the marketplace. 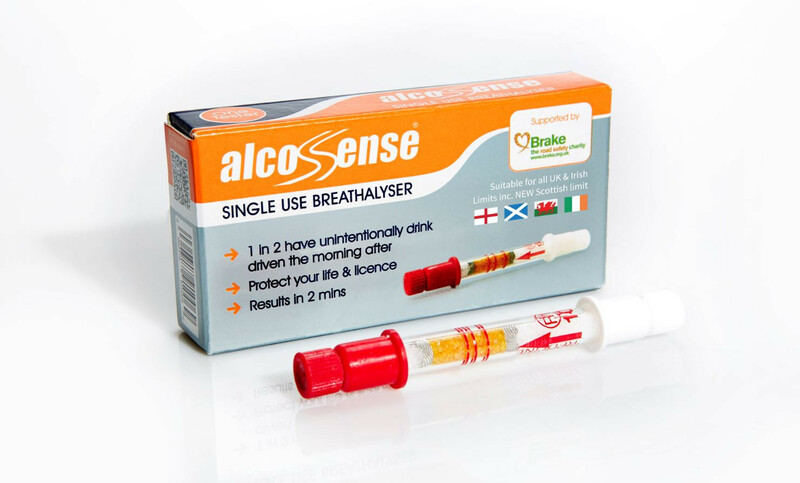 If you are looking to introduce AlcoSense Single Use Breathalysers to your organisation for screening or as promotional gifts please contact us for bulk pricing. Part of the responsible enjoyment of alcohol is to understand its effect on the body and to understand when you are safe to drive. AlcoSense™ helps people do exactly that and takes out the potentially fatal guess work the morning after. Don't leave it to chance, order yours now. “It’s very easy to be still over the drink drive limit in the morning; and the ‘Morning After campaign’ the Police have been running are picking up a lot more convictions now than they did 10 years ago. It’s worth getting yourself a DIY breathalyser. "A really, really handy thing and it's not expensive." Looks good , feels good, must be OK! Never used it but its always in the car and its reassuring to know it's there if I need it.